For me the fun of this business I’m in is in the glass… creating a tiny work of art (hopefully!) from raw glass and a flame always sets my little heart aflutter. But, I’d be drowning in a million glassy orbs if I didn’t string them together every so often and make something to wear. Therein lies a whole other pleasure…different, but very pleasurable all the same. Gathering elements together that are cohesive and play off of one another in different and unique ways ~ that is the labor of good design. 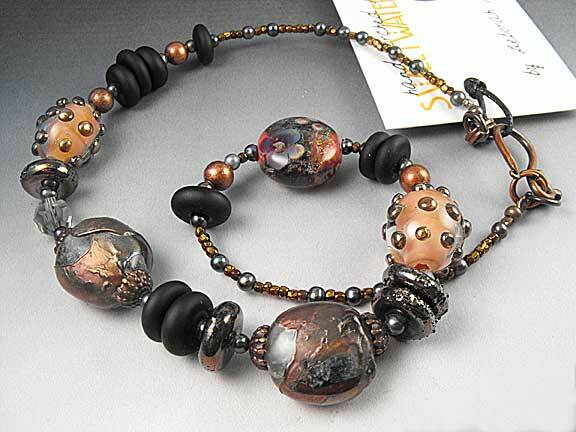 I like an unexpected mix of materials ~ the metals especially, like oxidized silver and copper..I do love that. Personally I’ve never liked gold with any other metal, but that’s just me..I know that there are some beautiful designs out there that work wonderfully. I’ve just not found it to be true for me. I also like to mix the humble little seed bead with the more expensive components like freshwater pearls. 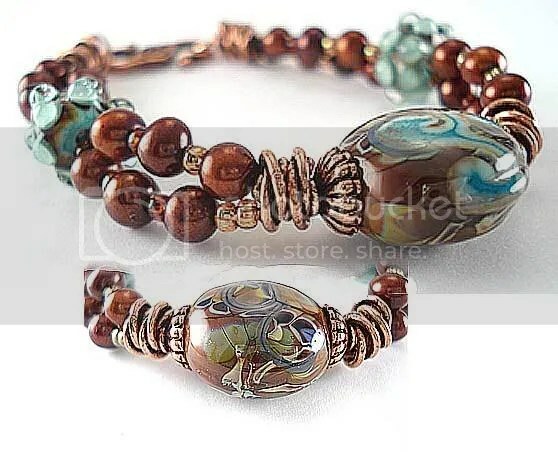 I love the tiny Czech beads..oh the colors! Complete symmetry bores me to tears so I usually do try to stir things up a bit while maintaining a balance of elements in other ways…color or texture for example. It must’ve been that time of the month. Usually, what comes out of my work room is a little more like this..
Harmonious designs are key. Whether are not you choose to mirror your materials on both sides of your focal it’s important to keep the design balanced. If you’re into some reminders about it all there’s some good stuff here on basic design principals and good composition ..
I’m not by any stretch saying that the above images are the epitome of good design ~it’s all a delightful learning process and I learn as I go. These are some of the things that I’ve made in the past that were generally pleasing to my eye and hopefully to a few others as well..
Of course it goes without saying, but I’m feeling the need anyway… Enjoying yourself is a key ingredient to the creative process. § 13 Responses to >Pulling it all Together..
>just got your note.. thank you so much!! >Just wanted to say…I think your work is beautiful. >Purty… I love the combinations you have here. A feast for the eyes! >I think those are beautiful. I envy creative types. I try to be one and it never ends well but it doesn’t stop me from trying. >Great post. 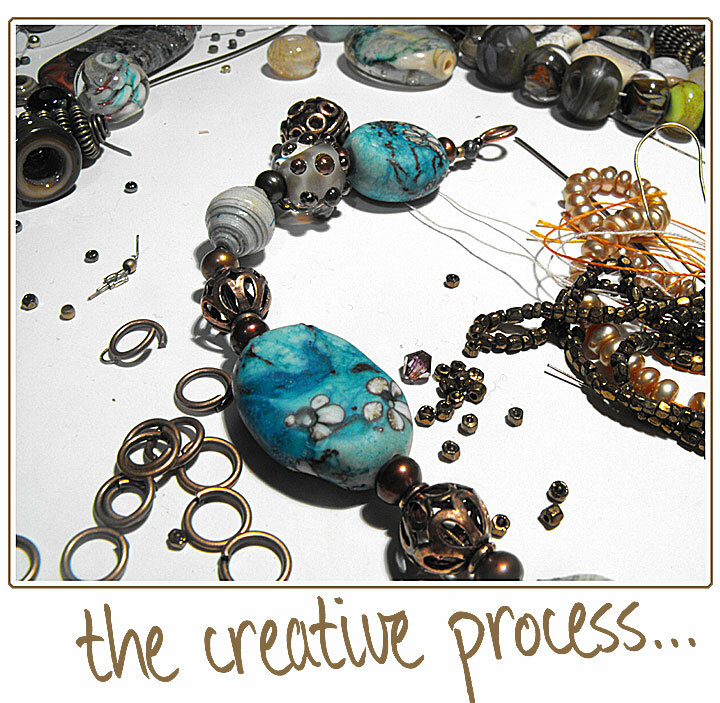 I love reading about other artisans design process. Even if you work in a totally different medium there is always something I can learn about how you use materials and put things together. >This is really unique and beautiful stuff. Easy to find a lot of new and interesting things wandering around the blogosphere! >Yea…the iron on hem stuff is great… although it’s not durable enough to withstand cats fighting with curtains in-between. Oh well. Love your work! That asymmetrical bracelet is just stunning! 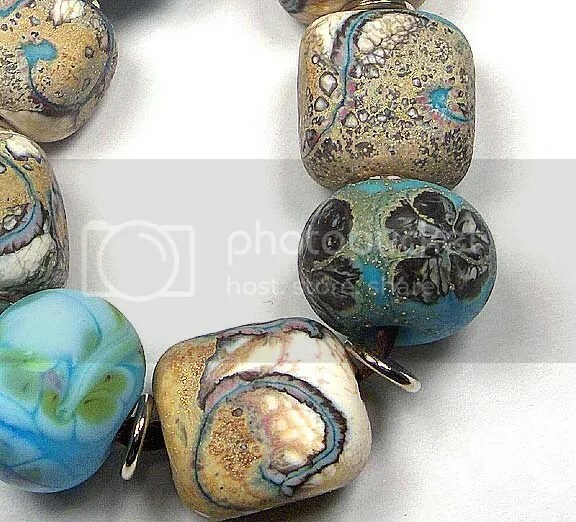 >gorgeous…really enjoy your blog….thanks for sharing your beautiful work …pop over for a visit..all my love mona & the girlsps.. moving the girls into theirnew house.. I'm supposed to be cleaning .. but wanted to come visit with you. Hey, I ran into your page from stumbleupon. It’s not an article I would regularly read, but I loved your spin on it. Thank you for creating a blog post worth reading! « >Top Dropper List…Thanks guys! You are currently reading >Pulling it all Together.. at fireandglass.